happy tuesday and i hope you were all able to get through your monday alright! 2. spf chapstick - another must! no red, dry or chapped lips here! burt's bees has always been a favorite and their sun protecting spy 8 brand is thee best for summer! 6. water - or 1 liter to be exact in this case! i'm already supposed to be drinking double the amount of water since i've been pregnant, but if i'm doing any sweating at all i load up on even more! make sure to stay hydrated and cool while laying out and soaking up the sun! 9. sunnies - another must have when bearing the intense summer rays! aviators are always a favorite of mine and these, these or these are next purchases on my list! 10. tanning oil - yes, i stressed sunscreen enough you'd think i didn't use any of this, but for those of you who are looking to get a little color quickly without having to lay out in the sun for hours, this is the way to go! maui babe dark tanning lotion has been my favorite that i've found thus far! although this summer i'm using this a little less of this and using my #1 a lot more, i will still throw a little tanning lotion on my legs from time to time to get a nice summer glow! so enjoy hitting the pool, lake or beach (for those of you lucky enough to live close to one!) 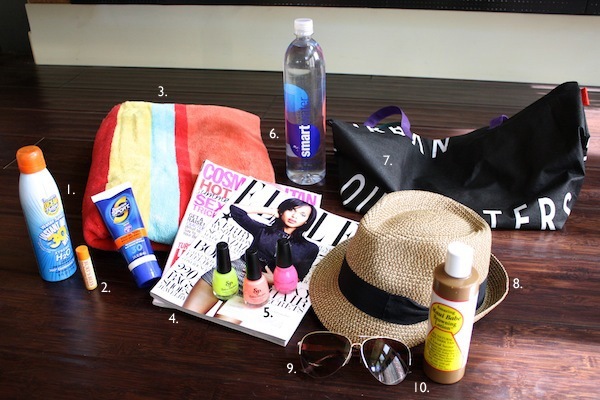 this summer and hopefully a few of these items will come in handy! I use Badger. It's one of the safe kinds. Something you may want to consider for your future little one. ;) Some of them are pretty dangerous and I cringe when I see parents putting spray sunscreen on their little ones. Definitely good to know- I hadn't heard but about this, really! Especially when using it on a little one! Oh geez, sorry I just have to say this... I know it's important about protecting against skin cancer and taking care of your skin and everything but come on people. The sun is not a new thing. It's not like all of a sudden it became this giant ball of firey cancer spewing anti-aging at people. I'm not saying this to you, but more because I've been noticing more and more people saying stupid things (like on instagram) and lecturing you about staying out of the sun. The sun does good things. Just in moderation (this crazy concept that you don't have to be psycho one way or the way, people don't seem to get this these days). I do agree with the post above about not using kinds that have all sorts of chemicals but again, with anything, in moderation! Ok wow, I'm done. I actually just wanted to say that I love Maui Babe as well. It's a must-have for sure! Great picks for the pool Robyn! I just painted my nails neon colors last night! Love this post Robyn! I will be picking up those polishes! Please do a makeup/skincare post soon!!! I think I'm going to try Maui Babe. I had a slight reaction to the one I had been using for a while last summer and couldn't find any others I liked after that. Thanks for sharing!